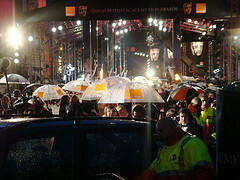 The film world shivered and huddled under brollies on the red carpet outside the Royal Opera House for last night's BAFTAs, presumably reciting a mantra about the Oscars and sunny LA not being far away. But the cold couldn't stop the Brit bandwagon as Slumdog Millionaire cleaned up and Kate Winslet continued her Extras-esque road to the Academy. There were wins for the capital's homegrown talent, too. Steve McQueen took the Carl Foreman award for achievement by a British director, writer or producer for their first feature film (seriously, that's its full title) for Hunger. Noel Clarke snaffled the Orange Rising Star award, less for his Doctor Who appearances and more for his sterling work on Kidulthood and Adulthood. And anyone wondering wtf that reference to salad was in Jonathan Ross's introduction to the costume design award, followers of Wossy on Twitter were less baffled. He asked for “one odd, unexpected word from Twitter and try to slip it, unnoticed, into BAFTA. Lets go !” (and then promised nothing sexual; probably wise). Ah, Twitter: even on a night of glamour, it still gets the last word.